Electric shooters 80cm confetti multicolour also called E-shooters or called for electric cannons filled with fireproof confetti or streamers. 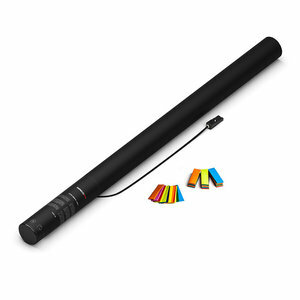 The electric shooters 80cm multi colour confetti is powered by a built-in nitrogen pattern and fires you off with Magic FX PowerShot, ShowFX E-shot PRO, Magic FX Shot Base or other electronic shooting systems. Electric shooters provide a spectacular time at your party, show, event, nightclub, opening act, action or drive in show atmosphere. Electric shooters, filled with confetti or streamers, are suitable for single use only. All Electric cannons consist 2 parts whose lower part a nitrogen-filled cartridge includes, for a powerful effect, and in the upper part of the confetti or streamers cannon is the fill to press is also known as serpentines. The universal plugs which are connected to the electronic in your shooter shooting system and launched the confetti or streamers on your time in the air. The electric shooters are easy to use, with a great effect! Where the distance determines the size of the Electric shooter, an electric shooter 50cm confetti shoots ca. 5 m far with confetti filling and ca. 12m if it is filled with streamers/serpentines. All in Electric shooters used Confetti and streamers is fire proof according to NEN-EN-ISO 6941. An official test report is available upon request.